The Cuisinart 766-26 chef's classic 12 qt. stockpot is perfect for simmering lamb curry or boiling up a party-size platter of pasta. It has 18/10 stainless-steel construction that won't react to acidic foods and includes an aluminum incapsulated base to ensure foods heat quickly and evenly. The cookware's riveted stainless-steel handle stays cool on the stovetop, while its lid seals in moisture and nutrients for healthier, more flavorful results. 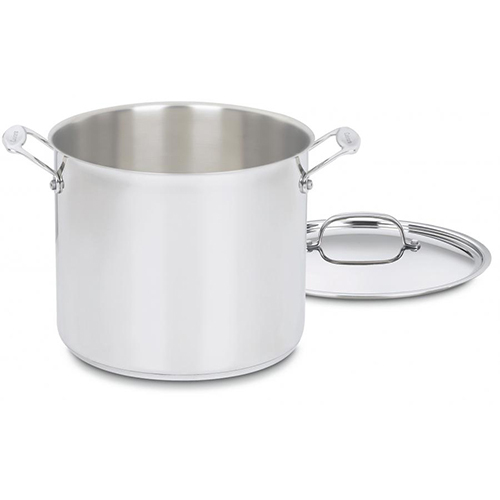 The Chefs Classic Stainless 12Qt Stockpot With Cover has many exciting features for users of all types. You can extend the lifetime of your Chefs Classic Stainless 12Qt Stockpot With Cover with the purchase of a FactoryOutletStore Factory Protection Plan. See the Chefs Classic Stainless 12Qt Stockpot With Cover gallery images above for more product views. The Chefs Classic Stainless 12Qt Stockpot With Cover is sold as a Brand New Unopened Item.